The basic goal of keeping customers satisfied has always been at the heart of customer service. The biggest change in customer service is the sheer number of channels through which people can contact your business, social customer care has grown bigger and bigger in the past few years. It has evolved from an unknown channel to a very important part of digital businesses. How has 2015 defined social customer care? In your point of view, what will be the main trends for social customer service for 2016? 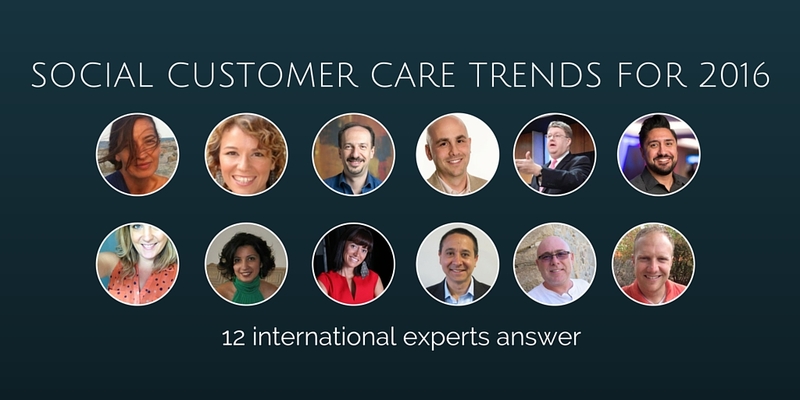 The answers help us identify the social customer care trends for 2016. Response time, mobile support, omni-channel communication, proactive service and a seamless customer experience are some of the key findings in the answers of these 12 experts. Hope you enjoy them as much as I do. During this year we have seen an increase in brands that no longer conform themselves with being present in social media, but are more aware that active listening and responses based in customer’s expectations generate value and loyalty. In 2016 social customer care will include new platforms, we will integrate tools that will help us improve our management and give more importance to the analysis of emotions in social media, in order to understand and improve our communication with our clients. In this 2015 the power of social media has grown in importance. For us social networks are a channel where we give service, we inform and we build relationships with our clients and our potential clients. They act as an amplifier that help us analyze and work internally to modify our processes and help us adapt to the needs and expectations of our clients. We continue to work on generating unique experiences and social media helps us understand what our clients think and expect. For 2016 we aim to continue improving what we offer to our clients and potential clients. We want to listen like we have done until now in a constant and standardized way, to be able to identify everything that is important to our clients and create systems that help us modify and adapt to their needs and expectations. 2015 was a year of transition for social customer care. Self-service and proactive customer support options force brands to re-think their overall strategies in order to deliver a seamless customer experience. Social Customer Service will become more and more ‘mobile’ in 2016. Some brands have already started pilot projects with instant messaging and this is just the beginning of a new trend for SCS. In 2015, more people started talking about social customer care. Companies began to learn that their fear of public complaints was unfounded – first, that customers were complaining whether or not the brand was participating, and second, that responding and engaging could actually satisfy even an angry customer. Perhaps more importantly, though, the major social media platforms started talking about customer care. Twitter expanded its DM lengths, offered new data and published a guidebook on customer service best practices, while Facebook began offering a response time badge and opened up brand Messenger pages to everyone. 2016 should be the year when brand response rates and response times finally improve. The fact that only 40% of social media complaints are addressed at all, and the fact that average response time is 5 hours when consumers expect an hour or less – these simply won’t be acceptable in 2016. Customers will respond with their wallets and take their business elsewhere if companies don’t respond or engage on social media. This will cause the companies that are still in denial to react by quickly building social care teams, making that skill set very desirable in the marketplace. Social care for Guests continues to mature. 2015 saw the continued evolution in the use of social communication between businesses and Customers. Businesses developed a pattern around responding to Guest questions and complaints, which marks continued acceptance even by those with rigid communication channels. Large companies were in some cases sluggish to adopt, leaving smaller, more agile companies to rule the landscape. That differential will continue to shrink in 2016 as everyone finally realizes they can’t ignore the social media Guest engagement channels. The method of a Guest starting in public, being taken offline to solve, and then hopefully being celebrated in public will continue. However, the trend will soon develop that these interactions will be handled totally in public as Customers become ever more comfortable with this public conversation. Exceptions will remain sensitive information such as financials and medical data. Consumers will continue to own this channel. It is an of-the-people-by-the-people line of communication. Companies need to begin to treat this more like a call center and move away from Marketing answering the posts. The CXO or Guest relations division will need to take point. More companies will launch social media handles specifically around resolving Guest issues and answering questions. Disney and Delta already have such handles on Twitter. Companies will continue to parlay social media into constructive conduits to hear their Guests. The evolution will not end with Twitter and as new social channels come on line we will see a blend of Instagram, Twitter, Periscope, Facebook, and yes, the good old fashioned email, be used to maximize the Guest experience. Growth has been the theme for Social Customer Care in the last year. As many companies find themselves with a Customer Care presence on Twitter and Facebook, they’ve been looking for what the next big steps is. Many teams have decided to focus their vision not only on Social Networks, but also communities and forums across the internet where customers are holding their conversation. With the growth comes efficiency and optimization. Customer’s used to be delighted by simply a response from the company, which made it easy to create a positive experience. This is no longer the case. Customer’s not only expect a response, but they expect you to solve their issue on Social Networks. Redirecting customers to call you or to your chat queue is no longer an option. You MUST solve customer issues on the channel they contacted you, and you need to do so quickly. Social Customer Care teams that are serious about quick response times (2-3 minutes) are finding ways to optimize their workflow, reduce moving parts, and staff accordingly to provide customers with a swift resolution as quickly as possible – to seize opportunities to delight customers. As Social Customer Care moves to own the end-to-end customer experience for customers on Social Networks, a focus on information security will play a big role in the next year. In order to be able to support all issues that customers contact you with, you’ll need to be able to gather their personal data safely and securely. Huge focus will be made on how to create a seamless experience for your customer that allows you to verify and cross-reference their Social Accounts with their internal Customer Account. Focus will also be made on how to secure the sensitive information that customers send you over social networks – allowing you to securely house the data rather than keeping it stored on a Social Network. There will also be a revived focus on metrics and data reporting. Teams will be going back to their core purpose and identifying those KPIs that best represent their mission statement. Teams that focus on Customer Delight will find new ways to measure what’s important to a positive customer experience and will base their core performance on those measurements. These teams will continue to create positive experiences and will share the success across their company. Response Time, which played a big part in 2015, will continue to be a topic in 2016. You will see more companies move from their ‘about an hour’ goal to just minutes – with some companies measuring response times in seconds. Some may try different methods for achieving this, such as Automation or Keyword Analysis. Customer’s contact on social as a way to be heard and to have their issues resolved. It’s important to respond quickly, but be sure to invest your time in listening to the customer, and to not remove the human element from your social interaction. I think 2015 was the year that social became the new Google. People would rather go to a brand’s social accounts than to a company’s website for answers to their questions, because they believe (and expect) that their question will be answered more quickly this way. 2015 was a promising year in terms of social customer care. It became one of the most important concepts providing real-time, multichannel support. Many people, as well as businesses realized that social care can facilitate customer service which is so essential in today’s world. Despite of our “job title”, any of us should keep in mind that customer service starts with each of us and we can be that change to the better. 2015 has been a consolidation year for social customer care in latin markets, and we can observe a general curiosity, concern and need in companies. They are starting to understand the need to answer through digital channels like Facebook, Twitter and other emerging platforms like Whatsapp. Social Customer Care is no longer unknown and clients are starting to demand fast, human and transparent answers on social . However we can still see a lack of organization within companies, customer care teams are yet to be strengthened and structured to work in a collaborative way with the rest of departments in order to be able to respond quickly and offer the right solutions to their clients on social media. For this to happen companies have to start creating protocols, escalation maps, defining their tone of voice and main metrics to be able to measure their effectiveness and offer a seamless experience. 2016 we expect social customer care to be more important for organizations in Spain and Latin America. Clients are sharing experiences as they happen thanks to mobile technology and they expect brands to exceed their expectations with new innovative actions. Brands can no longer ignore social media as a customer service channel, they will have to integrate new methods of communication like video and other social media networks like Snapchat or Periscope. Companies will have to invest in creating social customer care strategies and training their teams to be prepared for the change in the way their clients are communicating, but they will also have to train the rest of the organization to be able to work in a more collaborative way, applying a customer centric culture and adapting new technological solutions that will help them to communicate in a faster way with their clients no matter the department we are speaking with. 2015 has continued the momentum of the last eighteen months with the traditional delivery model continuing to be re-engineered. Social customer care is no longer marginalised as a novelty or afterthought; Twitter and Facebook have been normalised. These social channels are converging with their traditional counterparts under the all encompassing banner of ‘digital’. What we are seeing is a shift taking place where the notion of ‘digital service’ is being shaped into something that is more relevant to the expectations, behaviours and mores of today’s networked consumers. While no one can question whether social has made a contribution to customer service, social perhaps, continues to make a greater contribution as a catalyst for change in the way we think and do, rather than at the technological level. As Clay Shirky writes in Here Comes Everybody: The Power of Organising Without Organisations: “Communication tools don’t get interesting until they get technologically boring”. If the customer service of the last fifty or so years has been defined as essentially a time-bound transaction that was physical, linear and synchronous, then perhaps the next fifty years will be characterised as something more visual, more responsive, more contextual, perhaps even more visceral than ever-before. And at the heart of this emerging service experience – data-driven ‘micro-moments’. My sense is that we are approaching a tipping point where a more relevant service model will emerge. A model that acknowledges the contribution of the past, but is not defined by it. The emergence of Uber, messaging, video and cognitive intelligence, added to the mindset of social and mobile, together with Snapchat’s notion of impermanence, points towards the possibility of a different type of service model evolving. This is not a revolution, but an inevitable rewiring along an evolutionary journey. But for this different type of service model to evolve, then in my opinion, community and knowledge, two areas that I believe are fundamental building blocks of the future state of customer service*, must be challenged, provoked and re-engineered. Both must free themselves from the tyranny of ‘we’ve always done it this way’. Will social, once again, be the catalyst for this shift? Perhaps. *I am not a believer that customer service will be the function of a single department, but something closer to a Twelpforce and Mila where online and offline work in tandem, where the organisation becomes a ‘services platform provider’. 2015 has been critical for exposing the use of social networks as a customer service channel for brands. I would say that right now it only makes sense to be in Twitter if it’s for customer service. If you are in Twitter it’s for listening and having conversations and this translates into service. A good service needs to be fast, unique to each channel, kind and empathic, unique qualities of a good Community Manager. For 2016 we will have to go one step further, surprising our clients, listening in a proactive way. We as brands know when there will be special moments that will require customer care, and if we can go one step ahead we can avoid crisis situations and generate engaging moments with our clients. This will imply having powerful listening tools that will help us in that task. Another important aspect for 2016 will be introducing the tracing of the customer care attentions we handle. If we are able to contact the client after a short amount of time to see how everything is going and follow-up we will surprise him, connect with him and create loyalty. In 2015, social customer care continued to gain momentum. Contact center software providers are working feverishly to add robust social listening tools to their product offering. Companies are still approaching it with caution, especially amid more instances of negative posts that went viral. Companies that have developed communities and proven the ability to respond well to customer inquiries are rising up as leaders in the customer service space. In 2016, I expect talk of omni-channel to gain more momentum as companies work to offer not only social, but SMS and give customers a seamless service experience. 2016 is for sure an exciting year for social customer care, brands will have to create their strategies, train their teams and put their client’s at the center of everything. As we could read in all the interesting answers: proactive service, fast answers, customer centric culture are going to be very important for this year. And remember: Customer care, when done right, is a strong point of differentiation. How will you handle Social Customer Service in 2016?